May is Motorcycle Safety Month! Just 2% of all registered vehicles in the United States are motorcycles, yet motorcycle fatalities represent approximately 5% of all highway fatalities each year. Around 80% of reported motorcycle crashes result in injury or death, compared to about 20% for automobiles, according to the National Highway Transportation Safety Authority. 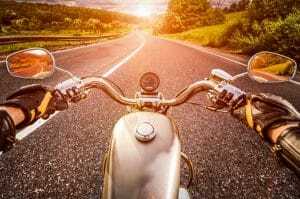 One of the main reasons motorcyclists are injured and killed in crashes at far higher rates than automobile passengers is that the motorcycle itself provides virtually no protection in a crash. While cars have extensive safety systems to protect passengers, the motorcyclist is directly exposed to any impact from obstacles and other vehicles. And because motorcycles have 2 wheels instead of 4, they are much less stable than cars, and their smaller size makes them harder for other drivers to see. So whether you are a motorcyclist or a driver of a larger vehicle, following these safety tips can help save lives. Wear a DOT approved helmet. In 2013, 41% of fatally injured motorcycle riders and 53% percent of fatally injured motorcycle passengers were not wearing helmets. NHTSA estimates helmets saved the lives of 1,630 motorcyclists in 2013. Wear the right gear. Jeans and a t-shirt, sandals and sunglasses won’t protect you from wind chill, flying bugs and debris, and road rash if you slide out. Wear a reinforced jacket or leather, gloves, full pants and footwear that comes up above the ankle. For your eyes, use a helmet visor or goggles. And choose bright colors to make you more visible to car drivers. Too often, drivers who hit a motorcycle say they just didn’t see it. Ride sober. Alcohol is involved in many fatal motorcycle crashes, especially after dark. In 2012, nearly half of the motorcyclists who died in single vehicle crashes had blood alcohol concentration (BAC) above the legal limit. Ride at safe speeds. Speeding is a factor in one third of fatal motorcycle crashes. Always ride at speeds that are safe for your skill, and for road and weather conditions. Be prepared to slow down if the road surface changes even for a short distance, such as potholes, a patch of sand or gravel, or water on the pavement. Invest in anti-lock brakes. An ABS system helps you retain steering control during an emergency stop, especially in wet conditions, so it can help you avoid a skid or a crash. Recent statistics show that motorcycles with ABS brakes were 37% percent less likely to be involved in a fatal crash than bikes without an ABS system. It may cost more up front, but it can save your life. Be defensive. In one study, researchers found that car drivers were at fault in 60% of collisions between a car and a motorcycle. So be alert to the cars around you, especially in this age of distracted driving. Watch for drivers changing lanes or pulling out from a side street, who may not be aware of you. Stay clear of aggressive drivers, and don’t drive aggressively yourself. Keeping to a safe following distance is especially important. Avoid riding in bad weather. Wet or icy roads, wind and rain or snow can all increase the hazards of biking, by reducing visibility, making it harder for your tires to grip the road surface, or pushing the bike around. These conditions also affect the drivers around you, making mistakes and accidents more likely. Keep your bike properly maintained. Always check the bike before you ride to make sure lights and signals are working and tires are in good condition and properly inflated. And get mechanical problems taken care of immediately so they don’t go critical while you’re riding. Allow more following distance. Motorcycle riders may suddenly need to change speed or lane position to avoid hazards that would not affect a car, such as gravel or grooved pavement. By leaving more space, you give the cyclist ahead of you more time to maneuver or stop in an emergency. Check your blind spots carefully. A motorcycle is small enough that it can easily be hidden in a vehicle’s blind spot. Always look for motorcycles by checking your mirrors and blind spots before switching lanes or starting a turn. Don’t assume a motorcycle turn signal means a turn or lane change. Motorcycle turn signals typically don’t switch off automatically like a car’s. A flashing turn signal may mean that the cyclist forgot to turn off the signal, so wait until you see the motorcycle start its turn before you proceed. By following these safety tips, both riders and drivers can help prevent accidents and enjoy the warm weather rides and drives.